The Chieftain Tank is one of the best known of the present generation of battlefield weapons, and is one of the most heavily armoured and armed fighting behicles in service anywhere today. It has not been without its detractors or critics, however, and there has been a running debate by military commentators for several years past on the relative merits of the British Chieftain Tank compared with the main battle tanks of other great military powers- the United States, Soviet Russia, France and West Germany - whose present equivalent designs afford a fasinating contrast with Chieftain in many key aspects. The Chieftain, however, was developed as a result of British tank experience in World War II and after, and reflects the priorities which British tank men felt to be the most important terms of firepower, protection and mobility. British tank development in World War II resulted in the famous Centurion, which first appeared in 1945 in the closing weeks of the war. The Centurion, together with the Soviet T-34/85, and German Panther, represented the culmination of thinking (arising from actual experience) which pointed the need for a "universal" tank had, meanwhile, been disturbed by the appearance of the Soviet Josef Stalin II tank in 1945, with a powerful 122mm gun. In the Immediate post-war years it became clear that Soviet Russia and her East European allies (later the Warsaw Pact powers) posed the greatest threat to Western Europe in any future conflict, and this led, subsequently, to the setting up of NATO. If war broke out, much of the initial fighting at least would take place in Europe, notably in Northern Germany, and Britain's armoured divisions were either located in or earmarked for deployement to Germany. The backbone of the Soviet armoured divisions in the 1950's was the formidable JS-III and its T-1- derivative, both with the 122mm gun, which could out shoot the 20 pdr. (84 mm)gun of the early service versions of Centurion. To strengthen the firepower of the Centurion, therefore, the British developed an introduced a "heavy tank gun", the conqueror with a 120mm gun specifically to match the Stalin. The Centurion at this time was classed as a "medium gun tank". The Conqueror was unsatisfactory in many ways; it was very heavy, noisy, relatively slow, and made an extra logistic liability for relatively few vehicles. By 1066 the Conqueror was withdrawn from service and an up gunned Centurion with 105 mm gun was in service. More significant still, however, was that the British by this time had a new tank in production, the Chieftain, which was to replace both the Centurion and Conqueror, with firepower superior to both. Initial studies for a new "medium tank gun" to replace these two tanks started in the early 1950's and by 1954 some definite proposals had been formulated by the British General Staff. It was planned that the new vehicle should not exceed 50 tons in weight, should have a gun of 120mm calibre, low sloped superstructure, particularly at the front, and a new, compact V-8 engine instead of the Meteor engine of the Centurion. It was originally thought that the maximum calibre of the gun would be no greater than 105mm, due to the weight and size of the 120mm round in a vehicle of relatively small size, buth this problem was overcome by developing a 120mm round with bagged, as opposed to cased charges, as used in large calibre naval guns. In the event, the 105mm gun was developed and fitted to later marks of the Centurion, and the 120mm gun became feasible for the new design. The new tank was originally designated "Medium Gun Tank No.2 FV 4201" and the contract for design work went to Leyland Motors, who had been main contractors for Centurion. Some fairly radical design features were involved in FV 4201, quite apart from the proposed 120mm gun. To give a low sloped hull, it was decided to dispense with the conventional seated driving position and give the drive a semireclining station, central in the hull front. A sloped, faceted glacis, quite similar to that of the Stalin tank, was featured in early design studies, though this evolved into a flatter sloped and cast nose in the final design. To give the best ballistic shape to the turret it was to have sloped, pointed front, eliminating the wide mantlet of earlier tanks. The well-tried Horstmann suspension, as used in the Centurion, was to be retained. In order to test the feasibility of the new requirements, Lelyland built a running prototype in 1956, largely based on Centurion components. Popularly known as the "40 ton Centurion", but designated FB4202 and intended only for test purposes, this vehicle featured both a semi-reclining driver position and a pointed cast turret front. There was still much development work to do, however, notably the need to develop a new engine capable of running on several different types of fuel in accordance with a new NATO policy decision introduced in 1957. Leyland came up with a new motor, the L60, which was a two stroke with vertically opposed pistons, developed from a German compression ignition design. This work caused the whole programme to be delayed and further complicated, for the entire rear end of the vehicle had to be re-designed to take the new engine, taking the weight above the originally scheduled 50 tons in the process. Ironically, also, troubles with this engine hampered the vehicle even after it reached production and service status. A finalised specification for the FV4201 was drawn up in 1958, and a wood mock-up was ready by early 1959. By this time the design contract had been passed from Leyland to Vickers-Armstrong, the speed requirement had been increased to a maximum of 26 mph, with a range of 300 miles, and there was an increase in elevation and depression of the gun to improve the maximum and minimum ranges. The first running prototype, without a turret, was ready in late 1959, and six prototypes with turrets were delivered for army trials in 1961-62. Various changes were introduced early on. The design originally had smaller road wheels than the Centurion, but this gave a ground clearance of only 17 inches, which proved too low. The problem was overcome by reverting to the same road wheels as the Centurion, and increasing ground clearance to 22 inches in the procerss. Rubber pads were added to the tracks to prevent damage to public roads, and the exhaust system was much modified following some technical changes to prevent the gearbox from overheating. The characteristics of the FV4201, subsequently known as the Chieftain Main Battle Tank, have not changed greatly since its first appearance, though there have been several detail changes. The outstanding feature of the vehicle is, of course, its L11 120 mm gun. This can fire APDS (armour piercing discarding sabot), and HESH/HE (high explosive squash head/high explosive) ounds with all charges inbagged form. Fire-resistant stowage is provided for the bagged charges. A ranging machine gun is fitted integral with the main armament, and is linked to the sight with graticule marks scaled for the appropriate types of ammunition. Rapid sight correction is possible by direct observation of the rangin machine gun strikes on the target. This basically simple optical ranging technique was first developed for later marks of Centurion, and its reputation as a "foolproof" and accurate system has been further enhanced in the Chieftain, and has given British tank gunners a "second to none" record, with a good chance of a direct hit with the first round away - important considerations when ammunition capacity in the tank is limited, and when the potential enemy may have superior numbers of tanks. For indirect fire the conventional type of ranging drum and elinometer are used. A contra rotating cupola with hand traverse enables the commander to select and indicate the targets rapidly, and a sight linked to the gunner's sight enables the commander to aim the gun from the cupola position. A GP machine gun is fitted to the cupola and can be aimed and fired remotely with the cupola closed down. The commander's main binocular sight is fitted in the rotating part of the cupola with the fixed part of the cupola containing nine periscopes to give an all-round view. The gun is stabilised in elevation and the turret is stabilised in azimuth, so that the gun can be fired with a high degree of accuracy even while the vehicle is moving. There is a light projector in a box on the left side of the turret, offering either white light or intra-red light for night fighting, the system being linked for elevation with the gunner's sight enables the commander to aim the gun from the cupola position. A GP machine gune is fitted to the cupola and can be aimed and fired remotely with the cupola closed down. The commander's main binocular sight is fitted in the rotating part of the cupola with the fixed part of the cupola containing nine periscopes to give an all-round view. The gun is stabilised in elevation and the turret is stabilised in azimuth, so that the gun can be fired with a high degree of accuracy even while the vehicle is moving. There is a light projector in a box on the left side of the turret, offering either white light or infra-red light for night fighting, the system being linked for elevation with the gunner's sight. The gunner and the commander have optical infra-red converters for their sights, and the commander's spotlight can be fitted with an infra-red filter. The driver's reclining position is flanked by battery and ammunition stowage, and he has a periscope behind his hatch. There are conventional steering levers with epicyclic gearbox and Merritt differential transmission. Transmission is automatic with foot pedal gearchange selector. The superstructure overhangs the tracks to give the necessary turret ring radius. Both the hull and turret fronts are complex castings, and the hull front is said to have given some problems in the casting when production first started. Chiftain Mk. I: About 40 of these vehicles were built, largely for extended troop trials and training. After test service with 1st and 5th RTR, the type was cleared for service in 1963. A distinguishing feature was the split hatches to the cupola similar to those on later types of Centurion. Chieftain MK. 2: This was the definitive production version which first went into service (with the 11th Hussars) in 1967. It had a one piece cupola hatch and special ventilation equipment on the turret rear to enable the vehicle to operate closed down in nuclear and biologival warfare conditions. The armour plating on the light projector was reduced, round stowage reduced, and snorkel wading equipment was supplied in place of a floatation kit originally envisaged. 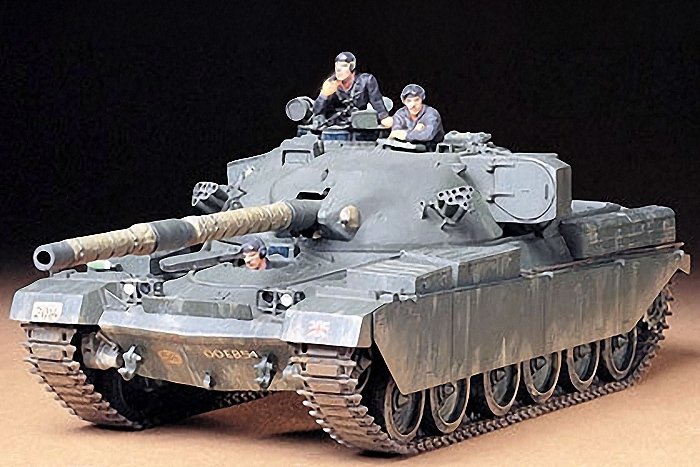 This type saw extensive service in the late 1960's and early 1970's, and indeed, the Chieftain rapidly replaced the Centurion as the British Army's main battle tank once production was under way. Special purpose models- a recovery vehicle, AURE, and bridgelayer have appeared. Chieftain Mk 3: This version appeared in 1969 and had a better auxiliary generator and detail improvements to the engine. The L60 engine proved complex, and successive marks of the Chieftain have had the engine gradually uprated to give the full designed power output. An improved cupola, and modified internal stowage were other changes. Chieftain Mk 3/3: This saw a big step forward, in that the fire control arrangements were modified so that an advanced laser sight for the gunner can be fitted. Chieftain Mk 5: First announced in 1970, this was the main type in service in the mid 1970's. Further engine modifications bring the power output up to 750bph, with consequent improvement in overall performance, and revision of the ammunition stowage arrangements enabled 64 rounds to be stowed. Splash plates have been added on the glacis. The Chieftain has been compared, inevitably, with the French AMX-30, the West German Leopard, and the US M60A1. All these tanks have speed and mobility superior to the Chieftain and are lighter in weight. They also have the 105 mm gun and are inferior to the Chieftain in firepower and armour. Whether mobility or firepower will be the most crucial to top quality in any European major war has yet to be put to the test, but the pace of the technology in armoured warfare is relentless. The Soviets have made big progress with fin-established ammunition (in their T-62 and new T-72 battle tanks) and the Israeli-Arab "Yom Kippur" war of October, 1973 showed for the first time that the main battle tank was very vulnerable to tactical anti-tank missiles skillfully employed. It may be, therefore, that the Chieftain could be the last of the traditional type of tank in the form in which it has been accepted for many years past. Whatever the future, however, Chieftain remains an exciting and powerful fighting vehicle. It has been ordered by the Iranian Army and has interested many others, though the great expense of one of these vehicles limits their availability.